Chewin: No one is my fashion icon. Any fashions attract me that are suited for dolls. I can re-sketch or redesign some parts before making. 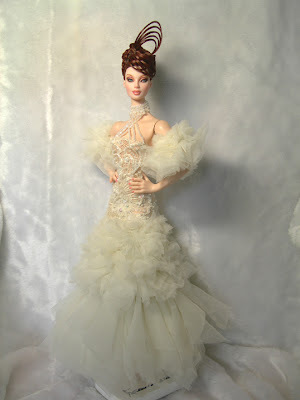 Some fashions are fascinating when people wear them but look so clumsy when they’re on the dolls. FDC: What is your favorite doll to work/design for? 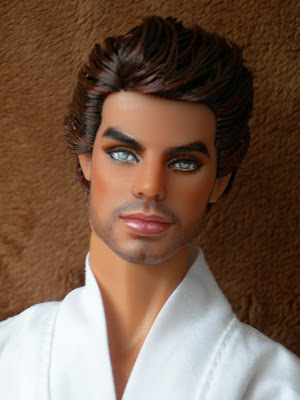 Chewin: Matt O’Neil is my favorite doll to work for, because the proportion of Matt is not too big or too small though his figure is not as perfect as FR Hommes. But after dressing him in fashions, everyone can imagine that he looks great as a supermodel or any kind of people we wish him to be. FDC: What is your favorite doll sculpt to re-paint? Is there a least favorite one? 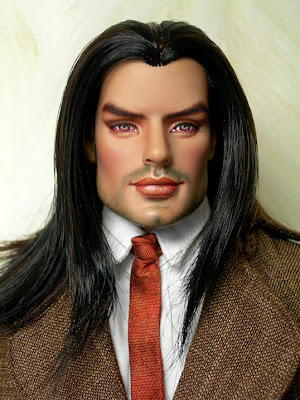 Chewin: I think the majority of doll repaint artists prefer working on Tonner Dolls because this company manufactures such a large variety of different doll faces. Also the detail that goes into each and every doll face is rather perfect. Finally the size of head is easy to hold which make the repainting process very smooth and easy. I like the face of Daphne and Angelina, they have a perfect detail on their face, but I don’t like Betty Ann and Osmopolitan, I think their facial shapes are a little too big. 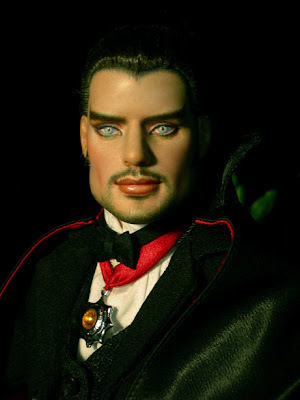 Chewin: My all time favorite doll is the Kotalin or Elizabeth dolls which are created by Jozef Szekeres. I feel he does exceptional work creating doll clothing and is very skillful at Fine Art as well. FDC: Do you try new techniques on spare dolls before changing a new one or do you just 'go for it', so to speak? Chewin: Yes, I always like to experiment and try new techniques on my repainted doll such as oils, acrylic, airbrush or pastel etc. Before I apply my new techniques, I always work with a spare doll first, to see the effect after repainting and to discover any changes that may need to be made in order to create perfection. Chewin: The fabric that is used for creating doll clothing is sometimes different from the materials we wear. There are specific materials that are best for 16-17” dolls but not suitable for 12-13” dolls. In regards to the type of fabric, I prefer using Thai silk, wool or jeans and I don’t like making outfits with leather or velvet. 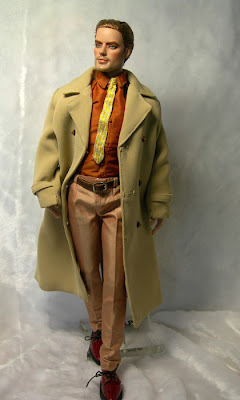 A lovely outfit for Tonner Matt, shirt and pants in Thai silk, by Chewin. of the Malipunte siblings' work. This is the end of part 2 of the interview. Next post will be the 3rd and final part. Photo credits: all photos in this post courtesy of Pornchewin Malipunte except the Kyori Sato photograph, courtesy of Stratos Bacalis.